Mailing Lists allow you send email campaigns to your mailing list groups and give recipients the option to selectively unsubscribe from each list individually or stop all communication. You will not be able to select a group of individuals to email in 'Campaigns' if you have not saved it first as a 'Mailing List'. You will be able to send a Direct Mail to any list. Please Note: It is required by law in some countries that unsubscribe options are made available for email marketing. Using Mailing Lists decreases the chances of your recipients unsubscribing from all email communication from you. Mailing Lists give the recipient the option to unsubscribe from lists that they don't deem to be of relevance to them and keep the lists they are interested in. Please Note: If you are providing the option for your recipients to unsubscribe from individual Mailing lists the name of the list will appear the same for them as it does for you. Step 1) Build your list of recipients as a static group of individuals. 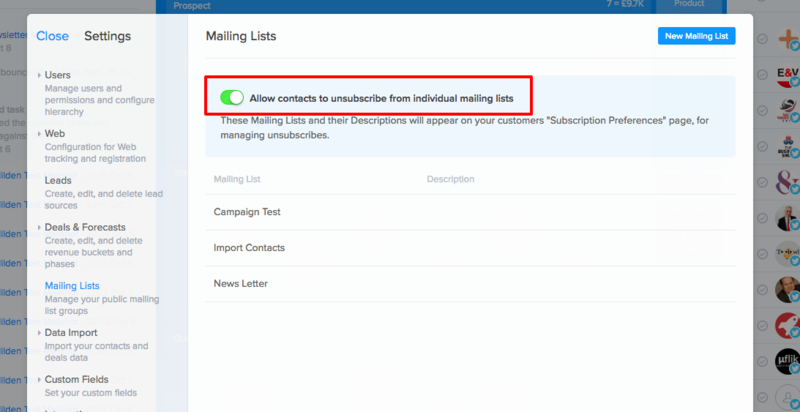 When this option is ON, and your contacts click 'unsubscribe' they will be directed to a 'Subscription Preferences' page where they can select which lists to be removed from. Step 5) Select 'Choose Static Group' and click the desired static group from the dropdown. 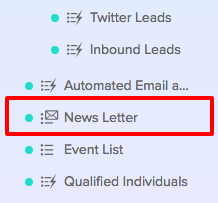 You have now added a Mailing List and it will appear in the drop down when building an email campaign. Question: Will I need to remove an individual from the Mailing List they have unsubscribed from? Answer: No, they will automatically be removed from that list for you. Question: How do I know when a static group has been changed to a Mailing List? Answer: When viewing your group in the Contacts section, it will show with an envelope icon. Question: Can I save a Smart Group as a Mailing list? 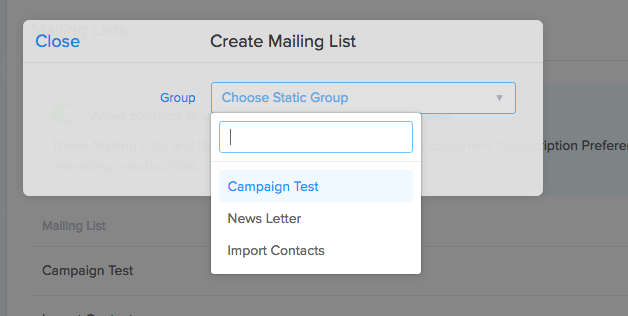 Answer: No, only a static group can be saved as a mailing list. This prevents individuals from automatically joining a mailing list through a filter after they have unsubscribed. 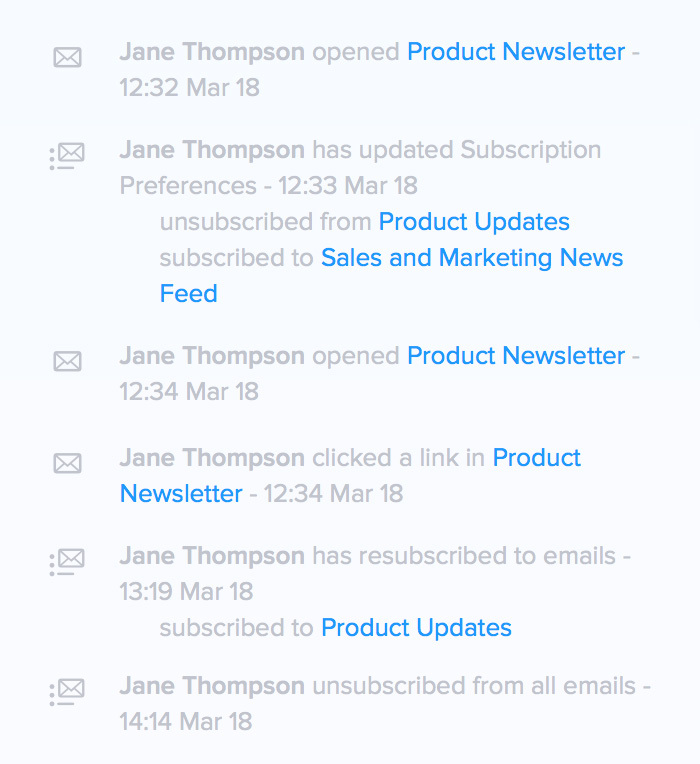 Question: How do I know when someone has unsubscribed from a Mailing List? Answer: When someone unsubscribes, it will appear in the activity feed against that contact record. Question: If someone unsubscribes from all communication, then I create a new mailing list, will they automatically be removed from that mailing list? Answer: Yes, individuals will automatically be excluded from future mailing lists if the 'Allow contacts to unsubscribe from individual mailing lists' is turned off. If it is turned on, then they will be included in all the future mailing lists. Question: Is it safe to delete email lists after use or will it affect the campaign results? Answer: You can. It's safe to delete a Mailing List if you no longer need it. You will still be able to view results (opened, clicked, unsubscribe etc) in the 'sent' campaigns section.